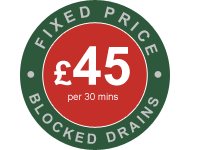 Here at AlfaClear drains we offer a emergency plumbing service for the Ealing Borough and surrounding areas throughout London. Have you got a burst pipe, leaking tap, overflowing blocked wastes or drain pipes? – then call us on 020 8723 2424 and we can arrange for one of our trained emergency plumbers to be on hand to fix the problem ASAP. Over the years we have been called out for a variety of problems from leaking taps to extensive burst pipes in the bathroom and overflowing sewage from blocked drains outside the property. No job is too big or too small for our professional emergency plumbing team. We have been doing emergency plumbing in ealing for over 20 years and have come accross all the different issues you can think of in that time. If you are looking for a professional team of plumbers that charge a fair rate and are not afraid to get their hands dirty to get the problem fixed then we are the plumbers for you. All of our emergency plumbers are fully qualified tradesmen and we have trained them to be professional at all times so that you our customer are in safe hands and are comfortable while they carry out the work. So if you need an emergency plumber Ealing or other surrounding areas throughout London then give us a call and we will get one of our team out to fix the problem.